Here are just a handful of the many students and employees who have worked at Vissot or studied English at Healthland. They have worked hard and achieved success in their lives. For some, Healthland and the Vissot industry was just a small stepping stone toward their goals, while others spent many years working in the industry and gaining valuable experience. Kimsreang has always wanted to be independent and learn for herself! She remembers when she was only young deciding that she could do anything a man could do and that she could look after herself. Kimsreang finished high school in 2000 and was accepted into university to study food chemistry. She joined Healthland as a way of improving her English and earning money for her tuition. She values the experience she gained and today has her own business at home - a choice she has made so that she can be with her children until they grow up. Kimsreang is passionate about her country and believes that the way forward is for Cambodians to support their own industry and products. She says, "By producing our own products we help people to work in Cambodia and not go elsewhere - moving abroad involves many risks. We should support our home industry." Wandath grew up in Battambang Province, Cambodia. He started working at Healthland in 2002, right after finishing high school. He did many different jobs at Healthland, first as a part-time worker in the production room, producing peanut butter, jam, curry paste and many other products. At the time, Healthland had a computer training centre where he helped as an assistant to the computer teachers. "I loved working with computers and wanted to practice the things I learned at school". In his last year, he was responsible for sales and marketing jobs; include, receiving purchase orders, deliveries, finding new markets, and collecting payments. Wandath said that Healthland provided him with a place to stay, part-time and full-time work, English language classes and a great work experience. "What I like most about Healthland is that it helps poor people, especially students, to continue their study in university. With Healthland, many students have a brighter future than they expected. Many of the students who have graduated from Mission College, Thailand have their background working at Healthland." 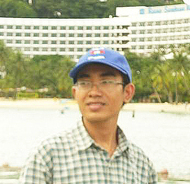 Wandath left Healthland when he received a scholarship from Southeast Asia Union Mission (SAUM) in 2005 where he completed a Bachelor of Business Administration, majoring in Computer Information System (CIS). He is now a Software Programmer for Sanitarium Health Food Company (Australia) working remotely from Mission Health Food, Thailand. His job is to develop software/applications, especially workflow to improve internal information technology processes. He would like to complete a masters degree in IT or Management so that he can progress professionally. "I keep dreaming that I can one day own a business and provide lots of jobs for poor students so that they can continue their study in university", he said. Wandath believes that the best way to help Cambodia to develop is to develop human resources. Cambodia lacks human resources due to poverty. Nowadays, many youth end their study at high school because they can’t afford to continue on to university. "To help Cambodia develop," he continues, "I would choose to help through providing the opportunity for poor students to to study at university through student loans, part-time jobs and a place to stay." "I would like to encourage people around the world to help share what you can for any program/project in Cambodia that aims to develop the country through education and human resources. I suggest this because I understand how great it is to have a chance to study while poor. I am one person who received the opportunity to continue my study in university through the help of Healthland. Daneth was only 19 years old when she started work at Healthland in 2000 by cleaning glasses and generally helping around the factory. She soon progressed to food production and eventually became a supervisor, a position she held until 2002. She values the experience she gained in working at Healthland as it taught her the value of work, to manage her time wisely as well as teaching her the importance of starting each day with God. Her English improved and today she has a BA Degree in Psycholoy and Education and is working as a teacher. She says,"The best way to help Cambodia to develop is to encourage Cambodians to support Khmer products and expand the company and if we have a chance, introduce all these products to other countries. In my opinion, first of all Cambodians must know how to depend on themselves and get more knowledge honestly. I will use all my knowledge to help people especially to know God who always helps us in all situations." Krisna was born in 1980 in Battambang province where he lived until finishing high school in 1998. After that, he moved to Phnom Penh to pursue a tertiary education. Krisna worked at Healthland for more than two years while studying his first degree. He says that Healthland helped him a lot and taught him how to work with other colleagues as a team. It helped him improve his English and how to help other people by creating job opportunities. Krisna gained experience setting up and managing a computer centre at Healthland which provided an important foundation for his future career. He believes that providing good quality and low-cost English and computer courses for students is the most valuable aspect of Healthland. He graduated with a bachelor’s degree in Computer Science in 2003 in Phnom Penh and later completed master’s degrees in both information technology and in public health. His is now pursuing a master of public policy at Victoria University of Wellington, New Zealand under a scholarship programs. Previous to that he worked with ADRA (Adventist Development and Relief Agency) Cambodia for nine years, first as an IT specialist and later as a project manager. "I would like to help poor people and vulnerable children in my country", says Krisna, "They are in dire need. He believes he can contribute by working through government agencies and local or international organisations. He would also like to volunteer his time to teach poor children in the community. 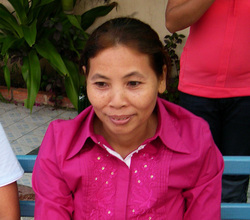 Mony Ouk is a single mum who came to Healthland in need of a job to support herself and her daughter. She started work in 2005 and stayed till 2013, eventually working as a supervisor in the company. Mony only had a middle school education, but she learned a lot from her experience with Healthland and would love to one day open her own restaurant and bakery to give employment to others. She sees job opportunities as a way of improving the lifestyle of Cambodians, to give them pride in their work and the ability to help themselves. Boremey had no skills when he first started work at Healthland and began by grinding peanuts, using a hand grinding machine. He glued labels onto jars and learned the importance of hygiene as he steamed jars and utensils. He peeled pineapples and other fruit to make jam and cleaned the kitchen and floors. The work paid for his tuition fees to learn English and gave him some pocket money as well. 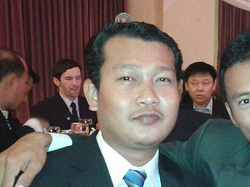 He gained a BBA degree in Accounting in 2004 and today works at World Vision Cambodia as a Donor Liaison Officer. Boremey has seen how Healthland has helped "teenagers and poor people like me" to work and expand their world view. He says, "I think children and youth are the energetic leaders of tomorrow so the more opportunities they are given to grow, the sooner we can see their potential realised and the better our world will become. To build quality leaders, I truly believe that we need to focus on quality education . I personally want to provide as many opportunities as possible to children and young adults so that their world can be expanded and their dreams can be pursued." Boremey's ultimate vision is to "see marginalized people come to Christ through business opportunities and marketable training skills." Malise grew up in Phnom Penh and attended English classes to develop her language skills to enable her to attend university. She graduated with a Bachelor in Finance in 2011 and a Bachelor of Education in 2012 and is currently employed as a senior consultant at PwC. She credits Healthland with improving her English and giving her experience in communication and team building skills. She sees education as the key to developing Cambodia and is anxious to help her country grow by attracting foreign investment. Sovan worked for a year with Healthland in 2006/7 as a quality controller and office worker. He is currently completing a Masters in Global food and Agricultural business as an AusAid scholar. As most Cambodians are farmers, Sovan sees agriculture as the main source of emphasis to reduce hunger and poverty. His training at Healthland has helped him to see the importance of high standards of quality and the development of technology in assisting farmers. He hopes to work in a company or NGO and do his part in contributing to economic growth, the reduction of poverty and improved education. Kanitha grew up in a poor but hard working family. She began working at Healthland in April 2006 to help earn income for her family so that her siblings could go to school. She began working in the production room where she proved to be a very hard working and reliable employee. A few years ago, Vissot's sales were not doing so well and Kanitha was asked to work in sales and deliveries. Despite being a fairly quiet person, sales began to grow again after she began in her new position. As a child, she gained experience selling cakes with her mother and the principles she gained from that she has applied in her new job. Her work at Vissot has helped her to grow in confidence, become more professional in her work and earn valuable income to help lift her family out of poverty. JC finished high school in 1999 and went to Phnom Penh to work with Ross McKenzie in Healthland. His work was very basic to start off with, but he eventually became a supervisor in the factory. His English improved and after a year he was accepted at the Asia-Pacific International University In Thailand where he completed a BA in Psychology and Education. JC worked for five years teaching and lecturing at schools and universities and then applied for, and received a scholarship to study in Australia and is currently completing a Master of Education degree at the University of Adelaide. JC is grateful for the "help and training Healthland has given to young poor Cambodians" and for the chance he has had to work for God. He believes that Cambodia "still has a lot of room for improvement, particularly human resource (quality human resource with good work ethic)" and is keen to use his education to provide training and encouragement for young Cambodians. His dream is to establish more schools and universities to help the young people in his country. Sokea began working in the food industry in August 1999. The industry was just new and still very tiny. She lived not far away from Healthland and called in one day to ask for work but she had to be turned away because there wasn't enough work. But she was very persistent and every day arrived early to ask for work again. Eventually, she was given some small packets of peanut butter to sell in the markets. Everyone expected her to quit after the first day because who would want to buy peanut butter in the markets? It was a strange food to Cambodians! It did turn out to be very hard selling but she never quit. She kept coming back to work every day and in August 2014 she will celebrate her 15th year of work at Vissot. Most of that time she has worked in production and usually in a supervisory role. Unfortunately, her husband died not long after she started working at Healthland but because of her employment she has been able to support herself. Bunsong joined Healthland to improve his English, but he found he learned a lot more besides. He joined Healthland in 2000 and worked four years as a sales team leader. The income he received helped to pay his fees at university, where he completed a BA degree in management. He is currently employed at Telecom, and his dream is to be a Sales Director in an international company. Bunsong sees the value of Healthland as a way to help students realise their dreams. He would love to see the company grow bigger so that it can provide employment for Cambodians like himself. He sees enormous potential for the company to help people improve their knowledge and raise their standard of living. He would love to see Healthland have its own farm! Ratha worked at Healthland from 2006 to 2011, first in the production room and eventually as a supervisor. The experience she gained there helped her with her university studies and today she is working as a medical rep with Ratanak Ratana Pharmaceutical Company. Her dream is to eventually own a business herself to help support her family. She believes that education is the most important ingredient for success in Cambodia and is anxious to help her country grow with the development of educational programs available to all.